Academics count big time for anyone trying to go to a four-year college and this includes of course all Student-Athletes. Four-year colleges have minimum GPA requirements of Student-Athletes and very often the required GPA is a 3.0 minimum or so. It is humbling to meet young Student-Athletes who on the Academic side are trying very hard to go above and beyond the minimums. 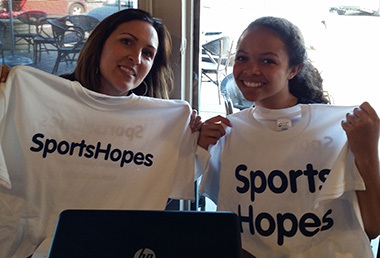 This week SportsHopes met with Kendall Hefner and her Mom, Beth Hefner. Kendall just completed her sophomore year at Castro Valley High School in CV, CA, where her JV Soccer Team went Overall 12-3-2 and in League 7-1-1. Kendall is a self-proclaimed SoccerGirl who also plays club soccer and is looking to participate in track as a sprinter in 2016-2017. Her total GPA by the way is a 3.94 and she’s very into STEM: Science, Technology, Engineering and Math. Sophomore year she completed Honors Chemistry, Honors Pre-Calculus and Spanish 3. It’s not easy but you are making it happen. Fantastic job, young lady!